The Running Novice | A newbie runner blogging about her training and her life. A newbie runner blogging about her training and her life. Hope everyone had a great weekend! Race recap from this weekend will be up tomorrow! Oh my goodness, this week has been so busy! I haven’t had time to run at all since I last updated (although I’ll probably go for one last easy run tonight so I can squeeze in some more running time before my race on Saturday) which I’m prety sure has been adding to my stress levels. I’ve gotten so used to getting my endorphins 5 days a week that dropping down to just 1 day since Sunday is just not good for me! My 20 page paper is finished so now all I have left are some assignments due tonight and tomorrow and then it’ll finally be the weekend! It has been extremely hot and the bars have been calling my name with their happy hour specials and their patrons looking like they’re having so much fun drinking out on the patios. So jealous of their free time! 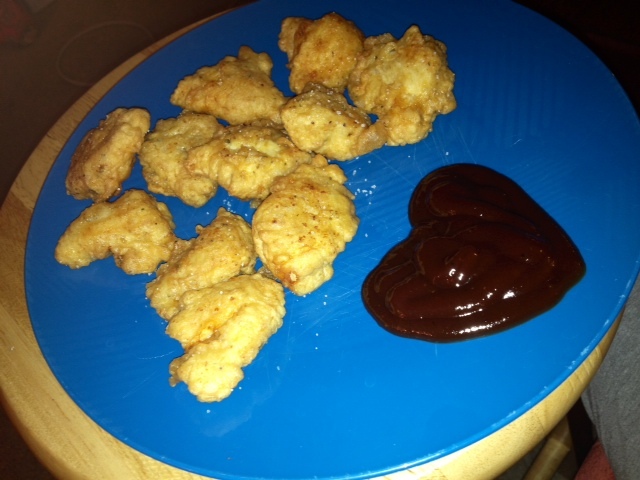 One night when I was staying up late to work on that research paper my boyfriend offered to make me homemade chicken nuggets 🙂 They were seriously the best chicken nuggets I’ve ever had in my life! Feel free to ignore the cheesy bbq sauce heart..he’s a dork haha. I promise they looked better in real life…the lighting was terrible! What’s the best homemade meal you’ve ever had? – Wow…I don’t even know the answer to my own question! Hmm, maybe buffalo wings I made a couple years ago? And I make the best mashed potatoes and coffee cake (separate, not together, gross!) EVER. Seriously. Is it unseasonably warm where you live? – It’s 87 here…the average for this time of year is usually in the 60s! My apartment doesn’t have central air so I’ve been baking all day long! Frozen coffee drinks? Yes, please! Over the weekend I went for my long run, actually, my longest run ever. I ran 5 miles without stopping and I felt awesome!! It was such a great feeling of accomplishment and I’m glad I can say that I’ve reached this milestone. This week’s running schedule is pretty mild and I’m just preparing for my upcoming 5k race this Saturday. I’m so excited because I have a really good feeling about my pace and I think I’ll definitely be able to get that sub 30 time! Today’s run was a 1.5 easy run. I ran it in under 14 minutes, which is the perfect pace for Saturday. Just hope I can hold on to that for twice as long. 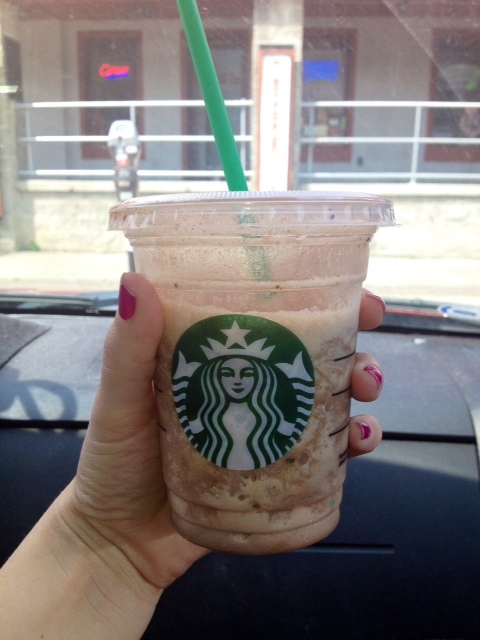 My big treat of the day: a tall mocha frappuccino. SO good on this super hot day. Short post because I’m in the midst of writing a 20 page paper that’s due Wednesday 😦 I’ll be back to normal after the race this weekend! What’s your most recent running/fitness milestone? – Other than my race, I’ll be celebrating my 22nd birthday with my friends and also picking the winner of the giveaway!! 1. Use good bread, or at least something better than white store brand bread! 2. Put a lot of slices of pepper jack cheese on the bread. When you think you’ve put an adequate amount of cheese on, add a few more slices. 3. 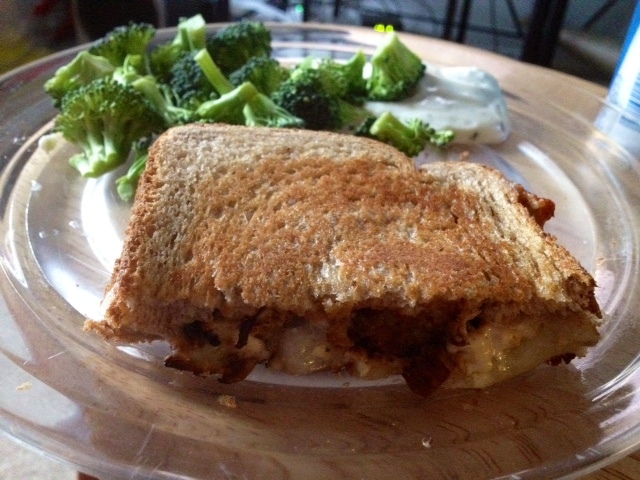 Dump tons of feta cheese on there, too, because there’s just not enough cheese already on the sandwich. 4. Add even more toppings. Specifically, bacon, chicken, and red onions. 5. Slather the bread with chipotle mayo on the inside and butter on the outside. 6. Fry that baby up on the stove until the bread is toasted and the cheese is melted! Eat one half of the sandwich…then stop and run and get your camera because you almost forgot to take a picture before you devoured the whole thing! Such a newbie blogger mistake! Mugs as big as your head! Last night’s run was AMAZING. I managed to get it in before it got dark outside so I didn’t have to go to the gym and run on the treadmill. This run was my fastest paced run EVER, including my previous 1 milers! I ran 2.52 miles in 23 minutes for a pace of 9:07!!!! I felt so good, albeit out of breath, the whole time! I didn’t have a goal pace and instead just let my feet do what they wanted. Best. Run. Ever. Today consisted of eating a lot of junk food and laying around pretty much all day long. Not the most productive of days, but I didn’t hate it 🙂 It’s a rest day as far as training goes, but tomorrow’s run is my longest yet — 5 miles! Fingers crossed I can get through it. Tonight’s agenda: finishing up some homework that’s due at midnight and starting on my huge research paper that’s due next week that I probably should have started working on 3 weeks ago. Yikes! Hello to all of my new readers that got referred to my giveaway by Janae @ HungryRunnerGirl.com (aka my favorite blogger of all time)!! I’m so thankful that she linked to my giveaway post on her blog. Speaking of that post…I need to keep reading that book! Maybe I’ll do a review post once I’m done and share some of my favorite things from the book with you guys. Oops, almost posted without any photos! 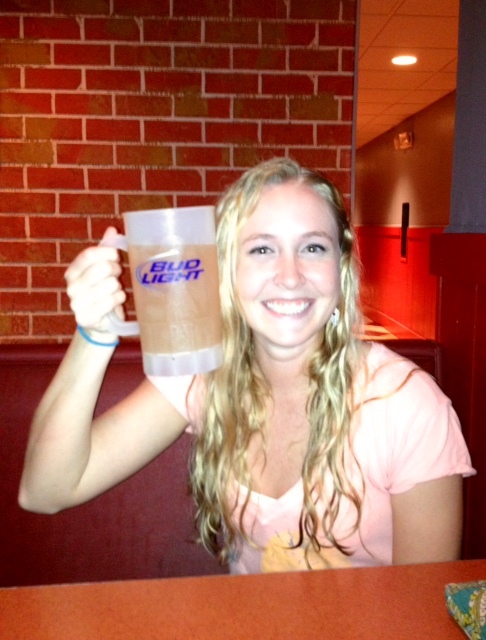 Here’s a picture of me from last night, note the wet hair and the beer mug as big as my head. What’s your favorite beer ever? Who’s your favorite running blogger (other than me of course!)? I know what the question on everyone’s mind is: did you shower before your exam? You caught me, this isn't an actual picture of me. But it's a pretty good representation of how I felt during my exam! Anywho, I think my exam went okay. Definitely not the most prepared I’ve been for a test in college but I currently have a 100% in the class, so I’ll be fine! Plus, it’s my last quarter of undergraduate classes and my senioritis is baaaad lately. I’m lucky I studied at all! I haven’t gone for my run yet, but tonight’s workout is a 2.5 mile easy run. Maybe I’ll throw in some upper body strength training just to make driving to the gym worth it. I would run outside, but I’m too tired to go right now and I’m way too scared to run outside at night! People get mugged all the time here and being a girl…it’s just not worth the risk. I think I’m going to start taking iron supplements every day. I don’t eat very much red meat these days (frozen chicken is about as good as it gets!) unless I go out to eat, and I’ve read that being low in iron can make running more difficult! Do you take iron supplements? Why or why not? Are you able to safely go for runs at night where you live? – My parents neighborhood, where I grew up, is super safe and has a ton of street lights. Whenever I visit them, I love to run at night! But these days, I’m stuck either running during the day or running on the treadmill at the gym. By the way, I think you should probably head on over to my giveaway and enter before it’s too late! Yesterday’s workout was a surge run…basically that means interval training according to my training plan! Usually, surge runs are my least favorite workouts. Last night, they were AMAZING. I just felt so good the whole time! 1 minute surges (fast pace run) with 2 minute recovery jogs times 12 for a total of 34 minutes. I ran it on the treadmill because I’ve found that I push myself a lot harder on surge runs when I have the fast/recovery paces forced on me. Every few intervals I upped the pace to really challenge myself. The last two surges got up to an 8:00 pace 🙂 which is the fastest I’ve ever gone on a treadmill. I ended up running for 3.51 miles at a 9:41 pace. I finished my night up at the gym with some spinning for about 40 minutes. Went 10.26 miles and got super duper sweaty…seriously, my shirt was drenched and there was sweat pouring into my eyes. I think I might need to invest in one of those wicking headbands soon! Once I got back home I “studied” for my midterm in Community Nutrition that I have tomorrow. And by study I mean I drank a lot of RedBull, ate a bunch of white cheddar popcorn, and read through all of the powerpoint slides from lecture. Hopefully it’s enough! I still haven’t showered…maybe I should do that before my exam. Or maybe not. Yeah, I’m gross like that. 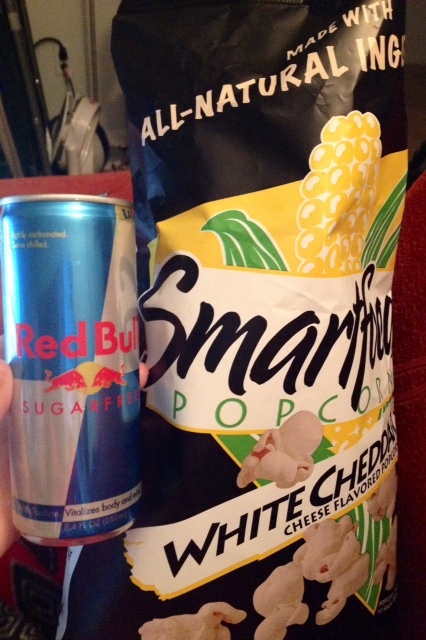 What was/is your study fuel of choice? What sort of workout did you do last night? I’ve been told that I’m a good cook, but I typically follow recipes and only tweak things here or there… Tonight was different. I decided to make something with the box of quinoa I had recently bought since I had never had it before, but I wasn’t going to be able to spend a whole lot of time cooking since I had a job interview that took up most of my afternoon. So I opted for the busy person’s best friend: the slow cooker. 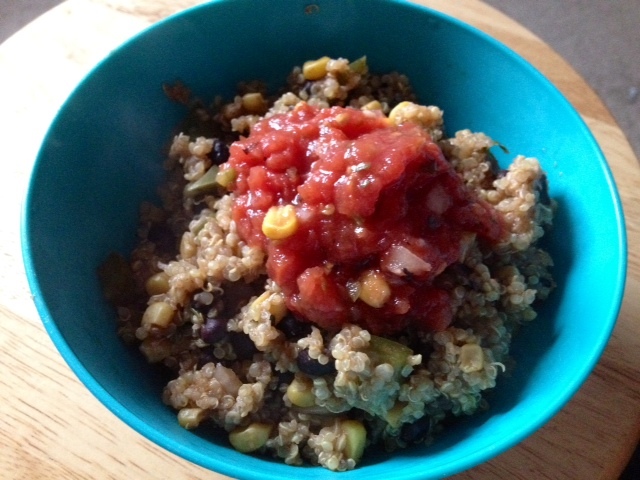 Combining what I had on hand with the quinoa meant this meal was quick, easy, and resourceful! Not to mention, it turned out deliciously. 1. Combine all of the ingredients, except salsa/sour cream/cheese in a slow cooker. Stir to evenly distribute ingredients. Have you ever tried quinoa? Do you like it? – Tonight was my first time ever having it and I LOVED it! Extra protein in a whole grain? What’s not to love? 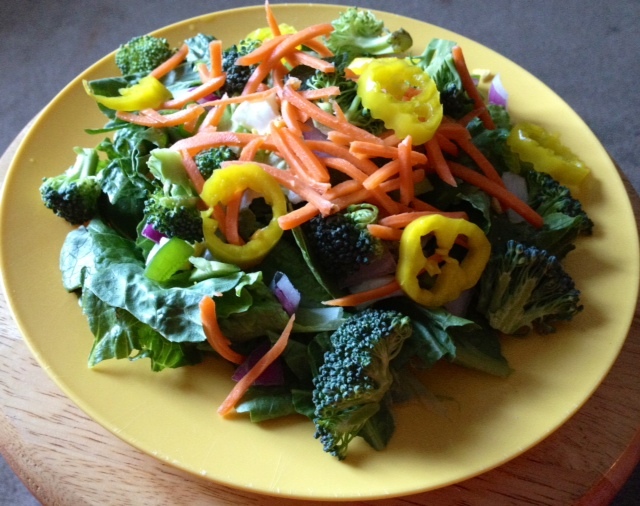 Share your favorite crockpot recipe with me! I love slow cookers! After I gave my lunch time to settle, I headed out for an easy 3 mile run. Maybe a big fibrous salad wasn’t my best pre workout meal choice… I had stomach cramps for the first mile or so but then I finally started to feel better for the last two. My goal pace was 10:00 and I finished in a little under 30 minutes, so I was fine with that! I thought it was going to be a lot windier out than it really was, and wore a long sleeve shirt. Completely unnecessary. 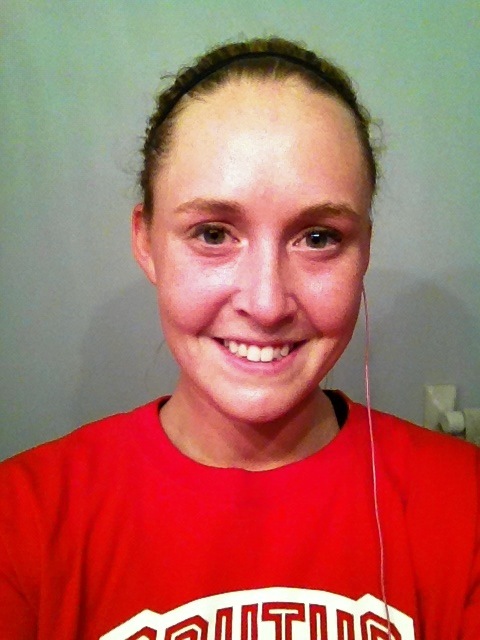 By the end of my run, my shirt was the same color of my face. What is your least favorite food or ingredient? – Ricotta cheese is gross. Have you entered the GIVEAWAY?? Obviously I did my hair and make up just for you guys! And yes, this is how I smile for pictures. I actually bought TWO copies of Marathoning for Mortals (one for me and one for you guys!) because I thought it would be a great giveaway item! The reviews on amazon say that it’s great for beginners as well as seasoned runners and is overall a great read. It even comes with training schedules. 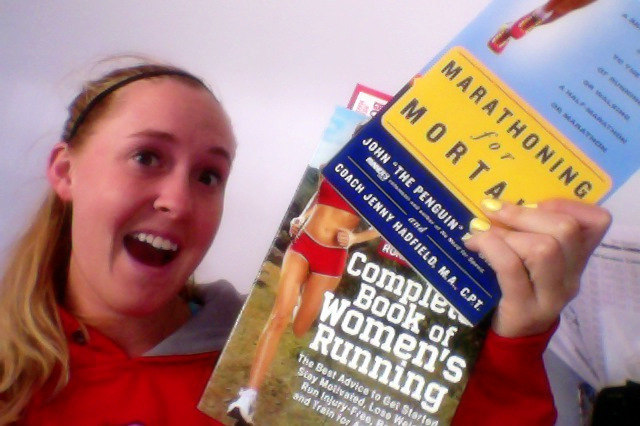 What’s your favorite running-related book? Welcome to The Running Novice! My name's Carolynn and I'm a 21 year old college student. My major is Human Nutrition and Community Health. I just started running this past winter. My current running goals are to run a sub-30 minute 5k and to complete a half marathon this year. I love to cook and I love to eat. Let's be friends :) Read the about me section for more info and don't forget to subscribe!